June 16 annually celebrates National Fudge Day. Although different desserts can date back about 5,000 years, fudge is relatively recent invention and has an American origin. There are many disputes about the invention of fudge. Some food historians say, that fudge resulted from an accident with a bungled batch of caramel. The sugar wasn't crystallized, that is why caramel was spoiled, as the interjection word “fudge” was used to describe the product, the name of candy was born. Original fudge consists of sugar, butter and milk or cream. It's cooked to the soft-ball stage and then beat to a smooth and creamy consistency. The recipe looks very simple, but it requires candy thermometer, that is why fudge is very easy to be overcooked or undercooked. There are some “foolproof” recipes, that were developed for home cook. 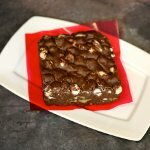 They include corn syrup, which prevents the process of crystallization, sweet condensed milk, marshmallow cream or other ingredients that guarantied the perfect fudge texture. But let's face the truth: they do not guarantee the same taste as original fudge! So if you want to make original fudge, use only traditional recipe or buy your favorite fudge at local store and enjoy it!